Turkish Journal of Forestry is an online, open access, peer-reviewed, international research journal. Language of the journal is English and Turkish. It publishes four issues a year. It covers subject areas related to forest engineering, forest products engineering, wildlife ecology and management and landscape architecture. Authors should only submit original work, which has not been previously published and is not currently considered for publication elsewhere. Research papers will be given priority for publication while only a limited number of review papers are published in a given issue. It is indexed in TÜBİTAK-ULAKBİM Life Sciences Database (TR index), CAB Abstracts, Zoological Records , Open Academic Journals Index (OAJI), Cite Factor, Index Copernicus and Cosmos Index. 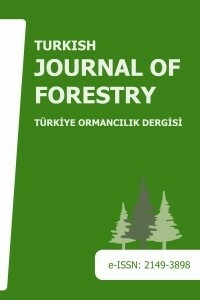 Turkish Journal of Forestry is the official journal of Faculty of Forestry, Isparta University of Applied Sciences. It was previously published under the title "Süleyman Demirel University Faculty of Forestry Journal" between 2000 and 2014.